If you live in Ohio and would like a free sump pump installation estimate, call or contact Superior Basement Systems today! We serve the areas of Alliance, Ashland, Cadiz, Dover, East Liverpool, Hartville, Massillon, Millersburg, New Philadelphia, Salineville, Wooster, Yorkville and many areas nearby. The liner provided by Superior Basement Systems is the ideal size- deep enough to keep the pump from short-cycling unnecessarily while being shallow enough to keep your sump pump running efficiently. To keep the sump pump from sitting in dirt and debris that may collect on the bottom of the liner, each pump rests on a stand inside the liner, lifting it up and away from sources of potential clogs. The liner is durable and will not rust, rot, or corrode over time. 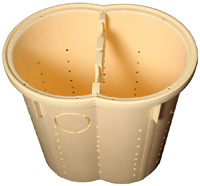 Superior Basement Systems's liner also includes an airtight plastic lid. This lid serves the dual purpose of sealing away odors and humidity that would otherwise invade the basement, while rubber grommets and an airtight seal keep sump pump noise to a minimum. 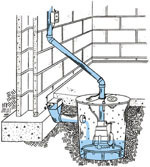 Additionally, a sump pump installation can include a drain on the lid that allows the system to drain away plumbing leaks. The best sump pump liners include a special ball-and-cup drain that closes the hole to keep humidity and odors from rising up from the sump pump basin. How will you know when your system fails? If you don't have a sump pump alarm, you won't know there's a problem until the basement's flooded. Superior Basement Systems's WaterWatch® Alarm can keep an eye on your water level, sounding off to warn you if the levels get too high. Superior Basement Systems has the answer you're looking for: the UltraSump® Battery Backup Sump Pump. Able to pump out more than 11,500 gallons of water on a single charge, it can keep the flood waters back until the power returns or you're able to service your primary sump pump. Call us today for a free backup sump pump estimate in Ohio! Two pumps discharging into one line: If you have two pumps in a sump pit pumping into one line, they'll push water in beyond the capacity of the pipe. If this is the case, what good is the second pipe? Running a battery backup sump pump and a AC-powered sump, this is not a problem, but two discharge lines are needed for two AC-powered sump pumps. Frozen Discharge Lines: In the winter, water in discharge lines can freeze, causing blockage in the line. Superior Basement Systems can address this problem with the patented IceGuard® discharge line system. IceGuard® gives your discharged water a second exit point should your line freeze. Sump pumps come in a vast variety of levels of quality- from cheap plastic models and do-it-yourself kits to sump pumps that are installed by plumbers, to cast-iron top-quality Zoeller sump pumps such as the ones installed by Superior Basement Systems of Ohio. 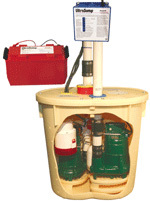 The best sump pumps on the market come with a reliable battery backup sump pump, heavy duty liner, sump pump alarm, freezing discharge protection, and a reliable sump pump lid. They should also be installed by an established contractor who provides a written warranty so you know who to call if you need your system serviced. 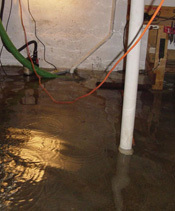 For a FREE sump pump installation estimate, call or e-mail Superior Basement Systems today! We serve the Ohio areas, including Alliance, Ashland, Cadiz, Dover, East Liverpool, Hartville, Massillon, Millersburg, New Philadelphia, Salineville, Wooster, Yorkville.